Money doesn't make you mean and being poor doesn't make you nice. Jerks cross class lines. Jerks are born, not made. At least that's partially the premise of writer/director Onur Tukel’s semi-satirical "Catfight," starring Sandra Oh as Veronica, a wretchedly unpleasant trophy wife, and Anne Heche as Ashley, a struggling angry artist who is equally awful. The two women hated one another on sight when they met in college, and that hatred blossoms into something even more toxic when they run into one another by chance at a catered affair. It's so toxic that the two women have a brawl in a stairwell that leaves Veronica in a coma for two years. When she wakes up, her whole world has changed. And that's just the beginning. This sounds like the plot of a melodrama to end all melodramas, or a "woman's picture" seen through a pitch-black lens, but the overall tone is deadpan. The women's fury erupts out of that deadpan, making both of them look absurd, like clowns having fake-fights for a howling audience of idiots. This is all played for laughs and for the most part, the laughs do come. These two talented actresses push the envelope in unlikability to the limit and there's something very cathartic about that. There's a scene where Ashley rips her assistant to shreds for using a blue shipping label, and Heche plays it real, ratcheting up her attack into such emotional violence that it's terrifying. To make matters weirder, "Catfight" takes place in a fictional time eerily close to our own where a new president has declared "war on the Middle East" and that war will require all hands on deck. Nobody seems to question it. Or even pay attention. On the television screens in every room, a late-night TV host cracks jokes about the dire state of the world before calling onto the stage the "Fart Machine," a guy who farts on command while the studio audience howls with laughter. It's clear now just how prophetic Mike Judge's 2006 film "Idiocracy" really was. Both women live in a nightmare of domesticity. Veronica's husband Stanley (Damian Young) is a war profiteer, and a mean-spirited version of the husband role Young played in Lisa Kudrow's HBO series "The Comeback." Ashley lives with Lisa (Alicia Silverstone) in a state of constantly simmering tension. Lisa is the breadwinner, does not like Ashley's ugly paintings, and wants to start a family. Lisa seems semi-normal at first, although there's a later scene at a baby shower that Silverstone plays brilliantly, one of the most openly funny scenes in "Catfight," where Silverstone reveals just how passive-aggressive and snotty her character is. Lisa smiles at Ashley in a way that looks supportive, but on a closer glance you can see the irritation and contempt. It's a very funny performance. The women have three fights in the film, and each one is a major affair, messier versions of the knock-down drag-outs that fill "John Wick" end to end. They take place in, respectively, a stairwell, a vacant lot and a forest glade. Attention must be paid to Balint Pinczehelyi, who did the superb fight choreography. The fights are operatic, raucous and extremely violent. They go on so long they practically rival the epic fight scene in "The Quiet Man." Stunt doubles were used, but Oh and Heche are clearly doing a lot of their own stunts, and they are so ferocious it's obvious these characters actually mean to kill one another. It's common to say that we live in a very literal age, an age where satire is dead, where people credulously share Onion articles on Facebook (and then dig their heels in when it's pointed out to them the article is not real: "Well, it COULD be real." Yes. That's satire.) But every age has its sacred cows, and satire chips away at those cows, at the privileged, at society's unquestioned structures and assumptions. "Catfight" is not at that level (satire is the most difficult genre to do well), and the film's tone is a hard one to sustain. The fights anchor the narrative, as do the various mirroring effects, with dialogue repeating and situations on an eternal loop. The world Tukel creates is one that is falling apart quickly. The country's atmosphere is that of Total War. The self-involved populace adjusts to it automatically. 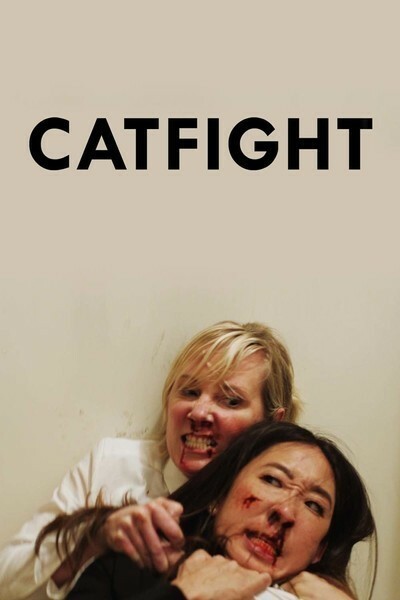 "Catfight" shows that civilization is an extremely fragile veneer over a pit of seething venom. It doesn't take much for that veneer to crack. And instead of pouring all their rage onto the powers-that-be who really deserve it—the people sending kids off to war, the television host parading a Fart Machine as entertainment, the audience who finds the Fart Machine funny, the entire unfair ugly world—these women turn it on one another. "Catfight" is not the story of two gals who hate each other and then realize, over appletinis, how much they have in common. Tukel takes that tired cliché and blows it to smithereens. Let's hear it for unvarnished hatred expressed with no holds barred.